The people - such as I - who were enjoying Super Mario Bros. 3 on their NES around 1990 may have been content, but it's possible they were led to wonder what games they might be missing on other systems. Bonk's Adventure, a sidescroller on the then mysterious (at least mysterious to me) Turbo Grafx and clearly intended by those behind it to compete with SMB3, may have intrigued NES players with its potential quality. Having now finished the game myself, I can report that while there may be great games for the Turbo, Bonk's Adventure is not one of them. Bonk's Adventure was among the first games I got with my Turbo Duo, on the Gate of Thunder CD. 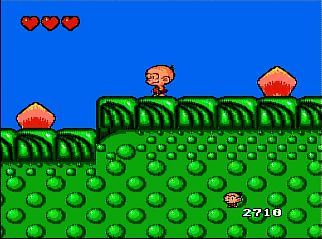 At the time, I was overwhelmed with my growing collection of games, and only played Bonk's Adventure long enough to briefly test it. My first impression was that the game was slow and not especially fun. After now dedicating the time to finish it, I know it's very easy as well. I beat the game in the lesser part of an afternoon. Sometimes I might find a game easy, but can still identify interesting ideas, even if they may not have fully worked, or parts that might challenge someone else. I can't think of much, if any, of that here: no interesting bits of level design, no difficult jumps (no, in fact, bottomless pits), no cunningly placed platforms or enemies. The game is unchallenging to the degree that suggests designing challenges was never a priority of the game. What was a priority, apparently, was making the game as cute as possible. Bonk the caveman, with his disproportionately large head, looks like an infant. Some nerdy dinosaur enemies wear spectacles. Bosses, when defeated, become your friends. And when Bonk scales a wall, he grips and climbs with his teeth. Whether a game could support itself with cuteness alone is doubtful; more doubtful yet when the game still hasn't forged a memorable personality. Climbing with teeth is uniquely bizarre, but little else in this game is. A walk across a dinosaur's plated back is more inevitable than inspired, in the context of the prehistoric theme; many more scenes could easily fit in any similar generically cartoonish adventure; and Bonk's enemies aren't as creatively eccentric as those in Super Mario Bros. 2. Bonk's Adventure is short - only 5 worlds - yet it feels longer than it is because of how slowly Bonk moves (and he cannot run). A game does not have to move rapidly to be enjoyable; however, when I consider slower games I have enjoyed, I notice that many of them emphasized cerebral over visceral appeals, and I found devising and applying strategies in them to be greatly satisfying. But Bonk's Adventure is not challenging enough to feel strategic. It just feels slow. Bonk attacks enemies by bonking them with his head, an offense that is limited in power and range. He also can jump, then dive at enemies with his head. But if he misses, he'll be stuck powerless on the ground for several moments, a penalty out of proportion with the move's effectiveness, which may dissuade players from bothering to master the technique. Most likely, the majority of the game will be played with the turbo of the 'bonk' button set to maximum. Then, when you press that button after jumping, Bonk spins extremely rapidly and is nearly invincible. 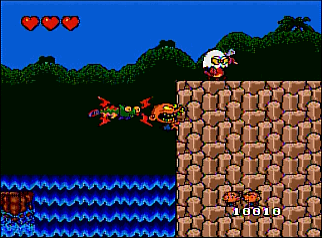 This spinning slows Bonk's rate of decent (like flapping the raccoon's tail in SMB3, but to an exaggerated extreme) and can allow him to float regretlessly past large portions of some stages. If any aspect of Bonk's Adventure comes close to redeeming the game, it would be the boss fights. They may not be great, but the bosses' patterns and defenses do provide more motivation than anything else in the game to use carefully aimed diving attacks. However, in the game's final stage, previous boss battles are rehashed, to be fought again all in a row. The appearance of a stage that reprises boss battles is often an indication that a game's designers have simply run out of ideas, and that sure is the case here. I've complained a lot about this game, but my greater complaint regards the dearth of merits worth praising, rather than the presence of aggressively objectionable flaws. Bonk's Adventure is cute, blandly inoffensive, a game that's forgotten shortly after playing, and certainly not deserving of inspiring speculative curiosity in those who haven't played it.